Cubesats, shown above being built at Montana State University, provide a relatively inexpensive way for students to see their projects designed, built, tested, launched and operated in space while still in school. This story was updated at 3:07 p.m. EDT. 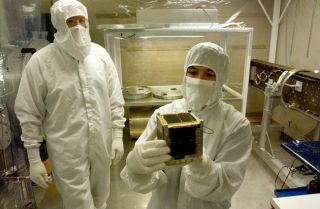 GOLDEN, Colo.— The National Science Foundation (NSF) has launched a program to use tiny CubeSats for science missions dedicated to space weatherand atmospheric research. TheArlington, Va.-based NSF?s interest inCubeSats stems from a recommendation in the June 2006 ?Report of theAssessment Committee for the National Space Weather Program — an interagencyinitiative to speed improvement of space weather services.? One of thereport?s recommendations emphasized that agencies involved in space weatherwork should look into the feasibility of using micro-satellites withminiaturized sensors to provide cost-effective science and operational datasources for space weather applications such as: improving understandingof space weather, helping predict conditions in the space environment andmeasuring the physical processes that affect the state of the sun and solarwind, as well as impacts they have upon Earth?s magnetosphere, ionosphere andupper atmosphere. The firstsolicitation for mission proposals in the new NSF program was issued in lateFebruary, resulting in proposals for 29 CubeSatscience missions, explained Therese MorettoJorgensen, program director in the Upper Atmospheric Research Section of NSF?sGeosciences Directorate, Division of Atmospheric Sciences. On Tuesday, the NSF selected "CubeSat-based Ground-to-Space Bistatic Radar Experiment — Radio Aurora Explorer," a collaborative space science project to be undertaken by Hasan Bahcivan of SRI International of Menlo Park, Calif. and James Cutler of the University of Michigan Ann Arbor. The selected experiment is slated to fly in December 2009. ?If anybodythought that these CubeSats would not do things ?this set of proposals just proved everybody so wrong,? Jorgensen told SPACE.com. ?There are a lot of questions in space weather research that are still beingstruggled with ? even though we?ve been flying satellites for many years now,?she said. Furthermore, the NSF program is meant to help train the nextgeneration of experimental space scientists and aerospace engineers, she added. NSForganized a workshop in May 2007 to bring together elements of the smallsatellite community. That gathering, Jorgensen said, focused attention not onlyon the scientific utility of small spacecraft, but also spotlighted theprospect that CubeSats can provide trainingopportunities for young engineers. Thatcombining of science research needs and young professional development is oneof NSF?s strong desires, Jorgensen added. However, what also came out of last year?smeeting, she said, was appreciating the scarcity of affordable launch. One focusof the CubeSat program is to facilitate launch of satellitesas secondary payloads on existing missions using the standardized CubeSat deployment system, the Poly PicosatelliteOrbital Deployer, or P-POD. Designed bythe Aerospace Engineering Department at CaliforniaPolytechnic StateUniversity in SanLuis Obispo, a P-POD is a tubular, spring-loadedmechanism designed to take up very little space. It can be integrated into anylaunch vehicle and protects primary payloads from the CubeSatsand vice versa. Launch ofthe P-PODS will be as auxiliary payloads on Department of Defense, NASA orcommercial launches, according to the NSF program solicitation. ?We don?thave a big NASA-type budget to do this. That?s why we are starting our programwith CubeSat. Student missions are by nature lowcost. I thought it was worth a shot,? Jorgensen said. The 2007workshop underscored the feasibility that scientific satellite missions in the$1 million to $10 million range (including launch) are possible. However, whilelaunches and launch opportunities are plentiful, securing regular, low-costaccess to space for small scientific payloads is not easy, Jorgensen said. CubeSatsare small. They typically measure about 10centimeters across and weigh about 1kilogram. A CubeSat can be heldin the palm of your hand, making use of standardized shapes that enable them tobe economically produced over a short period of time. They are considered idealfor students who can see a CubeSat designed, built,tested, launched and operated in space while they are still in school. Having NSFfoot the bill on CubeSat work — rather than NASA — ?isa real change,? said Bob Twiggs, CubeSat projectco-director in the Department of Aeronautics and Astronautics at StanfordUniversity in California. ?They want to do space weather, and I believe theonly way to get some space missions with shrinking budgets is to go thislow-cost way,? he told SPACE.com. Twiggs saidthe CubeSat community views NSF?s interest — as wellas the recent announcement that the U.S. Army may be building CubeSats — as all good news, seemingly taking the originalconcept of a ?toy satellite? into the realm of being able to do real spacemissions with them. Jorgensensaid the first launch opportunity for the NSF satellite program to supportspace weather and atmospheric research will be with the Department of DefenseSpace Test Program — a launch slated for December 2009 aboard a Minotaur-4launch vehicle out of Kodiak, Alaska. The NSFwill spend $500,000 to start the program, Jorgensen said, but her wish is toadd another $1 million in 2009. ?We hope to start a pipeline of missionsdepending on how the budget turns out for 2009. We will start fast or slow, butwe are committed to start a pipeline.? The goal ofthe NSF program is to construct a five- to 10-year program with annual proposalcompetitions. The CubeSatsupport is a first step, she said. Another goal is to secure a series ofregular, low-cost launches, spawned by establishing partnerships with othergovernment agencies and private industry, Jorgensen said. While the CubeSat proposals to NSF showed the strength, creativityand innovation of the community, Jorgensen said more work appears to be neededon three-axis stabilization of the small spacecraft. Still, much of the CubeSat work done during the last several years has createda foundation from which to draw from. ?We are leveraging off that wholedevelopment that has already happened,? she said.